A new publication by Persistence Market Research titled “Power Quality Equipment Market: Global Industry Analysis and Forecast 2016-2026” performs a detailed supply chain, market value, and market volume analysis of the global power quality equipment market over a 10-year forecast period 2016 – 2026. A comprehensive data analysis of the different segments of the global power quality equipment market across the assessed regions provides a 360o forecast of the global power quality equipment market along with useful insights capable of helping market investors, manufacturers, and other key stakeholders make the right business decisions. In the process of studying the global power quality equipment market, extensive research has gone into identifying the various elements that form the core components of study as well as the main factors likely to impact the global power quality equipment market performance during the period of assessment. A dedicated effort has gone into classifying the various market drivers and restraints, trends, and opportunities for players operating in the global power quality equipment market in the coming years. The publication begins with a succinct executive summary that provides a singular view of the global power quality equipment market followed by market definitions and taxonomy. This is followed by a quick analysis of the key market dynamics and the global power quality equipment market supply chain. The report then jumps into a comprehensive analysis of the global power quality equipment market in terms of both value and volume, including Y-o-Y growth projections and absolute dollar opportunity analysis. Regional pricing analysis is an integral part of computing the global numbers and the report does adequate justice in focusing on the average pricing analysis, revenue share, and volume share of the global power quality equipment market for the various segments and regions assessed. An important part of this market study is a detailed assessment of the short-term and long-term business strategies of key players operating in the global power quality equipment market – including manufacturers, suppliers, and distributors of power quality equipment. An entire chapter is devoted to the competitive vendor landscape of the global power quality equipment market including detailed company profiles of some of the top companies dominating the global power quality equipment market. 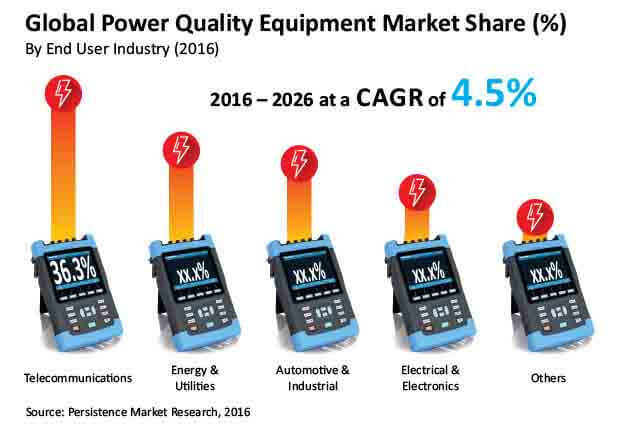 Information on the market share held by the top six companies in the global power quality equipment market has been incorporated to provide a panoramic view of the key player ecosystem of the global power quality equipment market. Ironically, Persistence Market Research analysts have observed that while the top six listed companies do hold a decent market share in the global power quality equipment market, a larger part of the market share lies with companies in the unorganized sector of the global power quality equipment market, which are mostly small companies. These small companies are competing with bigger firms and hoping to grab a larger share of the global power quality equipment market by introducing new products at competitive prices. These insights are an eye-opener, to both seasoned players as well as new entrants aspiring to make it big in the global power quality equipment market. Exhaustive primary and secondary research forms the core of Persistence Market Research’s tested research methodology for forecasting the global power quality equipment market performance over the assessed period. Data thus acquired is sliced and diced based on the relevant parameters and further validated using the triangulation method and finally scrutinized using advanced tools to glean pertinent qualitative and quantitative insights into the global power quality equipment market. All the insights provided in this report are supported by relevant metrics estimated for the various market segments across the assessed regions. The report is a comprehensive bundle of useful market insights and critical data points pertaining to the global power quality equipment market, and is intended to provide readers with a magnified view of the global power quality equipment market over the next decade. The telecommunications industry is witnessing rapid deployment of new and advanced technologies. The need for efficient, high-capacity electricity supply systems to power data centers, servers, and other internet related infrastructure in the telecommunications industry is boosting the demand for power supply systems as well as monitoring and control equipment. By end use industry, the telecommunications segment is expected to witness maximum growth in the global power quality equipment market over the forecast period, registering a CAGR of 4.8% between 2016 and 2026 to reach a market valuation in excess of US$ 20 Bn by the end of 2026. Recording an incremental opportunity of US$ 10 Bn during the forecast period, the telecommunications segment is inclined towards high value-high growth in the global power quality equipment market, with a revenue share of more than 35% by the end of 2026. Telecommunications companies are taking advantage of the sectorial boom and are reimagining their core business systems to provide innovative offers to customers. Mass digitization in the telecommunications industry is emerging as a top success imperative and telecom operators are leveraging the new technological advancements to come up with value added offers in a bid to expand their customer base and augment their market share. Digitization of the telecommunications industry is a major growth driver for the global power quality equipment market, which is headed towards continuous growth over the forecast period, registering a CAGR of 4.5% in terms of value and 4.1% in terms of volume. The telecommunications industry is highly dynamic, with changing data transmission formats and technological innovations making the market extremely volatile and competitive. The convergence of multiple data formats, information technology equipment, and a massive data explosion owing to the internet has mandated companies to provide power quality equipment that can overcome power grid, frequency variations, and switching transients issues and also offer enhanced service quality levels at all times. For instance, while traditional telecommunications equipment typically requires 48V DC power systems with adequate critical support equipment such as lighting and conditioning; a continuous expansion in telecom services along with rising power consumption calls for an increase in the demand for power quality equipment such as engine generators and power conversion equipment owing to high reliability, higher load power density, and codependency of AC and DC power load equipment. New and emerging technological trends in telecommunications are likely to have a huge impact on the global power quality equipment market growth, both in terms of market value and volume share. Global data centers are witnessing massive changes. Expanding data centers are the key driving force powering the global power quality equipment market in terms of meeting the demand for electricity in situations of emergency with high levels of efficiency and reliability. Power quality and efficiency within a data center can suffer from the issue of harmonic currents, thereby adversely affecting the productivity of the data center. To tackle the challenge of harmonic currents in data centers, companies are developing physical data center infrastructure supported by different types of devices that generate harmonics. This presents a major business opportunity for key telecom providers operating in the global power quality equipment market. The telecommunications segment is expected to be the prominent end user segment in the North America power quality equipment market during the forecast period, registering a CAGR of 4.5% in terms of value between 2016 and 2026. The telecommunications segment is projected to be the leading segment in the APEJ power quality equipment market, recording an impressive CAGR of 6.5% in terms of revenue during the forecast period.